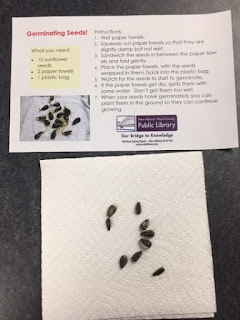 About 10 sunflower seeds - I bought a big bag of bird food sunflower seeds and tested some first to make sure they would germinate. They did! What do your seeds look like as they start to grow? Draw a picture of what your seeds look like when you start and check each day. When do they start to look different? How long do they take to germinate? The seeds in this kit are sunflower seeds. What foods do you eat that have seeds in them? Do they have many seeds or just a few seeds? If you try germinating those seeds the same way, what happens?